Surf can be a strange genre at times. It can both exist independently and be connected to Tiki culture. Despite the name “surf,” a surf song can have little or nothing to do with surfing (something that will be made very obvious over the course of the Freaky Tiki Surf-ari). What makes surf music “surf” is its distinct “wet” sound. Said sound is made by the spring reverberator in amplifiers for electric guitars, which can sound like waves. Hence the title of Strange But Surf’s second album, Swimming in Reverb. Interestingly enough, the CD’s cover shows the band in front of a Tiki bar called Otto’s Shrunken Head. This is the essence of Freaky Tiki Surf-ari: the mixture of Tiki, surf music and horror. 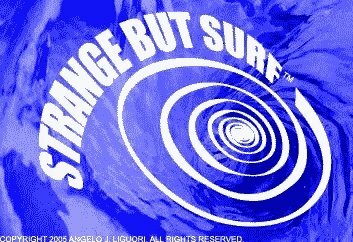 According to their Facebook page, Strange But Surf came into existence in 2003. That page also has a great quote from the band themselves: “More than just Surf, we combine Blues, Oldies, Rockabilly and more into our own genre of music, known as Strange But Surf.” Their online radio station also lists “Spy, Space, Horror, Tiki, and Lounge” as sources of inspiration. Although Swimming in Reverb is largely a surf album, some of these influences are present. The album kicks off with “Secret Sea” by “Unknown.” Is it a cover of a song whose creator’s name is lost to the ages? Is it an original creation by a cheeky band member – after all, who’s better to write a secret song than an anonymous person? I can’t say for sure. All I do know is that I like it and that it is easily identifiable as surf to even a neophyte of the genre. Like the song before it, “Lobster Rock” is a snazzy instrumental track. Unlike the song before it, its author is known: SBS guitar player and drummer Barry Simon. “Hey Ho!” is by band founder Angelo “Marbles Mahoney” Liguori (also a drummer and guitar player). The limited vocals are a nice touch and sound authentically old school. If not for the brief references to the Ramones, this could easily pass for a 60’s classic. Due to its mix of content, Swimming in Reverb is a great way to ease in a traditional surf fan into the realm of spooky (or vice-versa). You won’t find it in most retailers due to it being published on CD-R, but you can easily order it directly from the band. If the use of recordable media irks you, then you might be pleased to know that Strange But Surf went the extra mile and used a type of disc designed to look like a miniature vinyl record rather than an unlabeled CD-R with the album name written on with a marker. In fact, I think it adds to the authentic 60’s feel of the album! Special thanks to Strange But Surf for the review copy!